Aidan came to Christ after searching the Scriptures as a young adult. 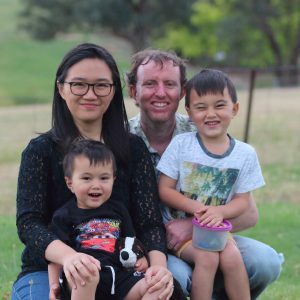 He went on to study God’s Word more deeply at Trinity Theological College (Perth) and was convinced to give his life to the ministry of the Word. Alfinda grew up in Indonesia where she became a Christian in high school. In 2010 she went to Perth to study at university and her faith grew exponentially through campus ministry. She was compelled by the Gospel to serve God with her life. Aidan and Alfinda married in 2012 and have since pursued a call to serve God through Bible translation. They knew nothing about the Roma apart from the pop-culture notion of “the Gypsies” (incidentally, Alfinda dressed up as a Gypsy girl for her year-book photo in high school). But in 2016, as they were investigating where to serve with Wycliffe, they were introduced to the Roma. Since then God has been growing a commitment in their hearts to serve among the Roma. The Roma are spread all over Europe with a high concentration in Eastern Europe. Many experience marginalisation from the wider society and live in poverty, with low education and poor health. Yet Roma in great numbers have turned to Christ and found salvation. With churches springing up in many communities comes the need for deeper discipleship and a greater understanding of God’s Word. Aidan and Alfinda are excited to be part of this through Scripture translation and literacy education in the Roma language, Romani. They will be working as part of the SIL Roma Service Group in Europe and will be the first team members assigned to Macedonia. Lord willing, they and their two boys will move to Skopje (capital of Macedonia) in early 2020.